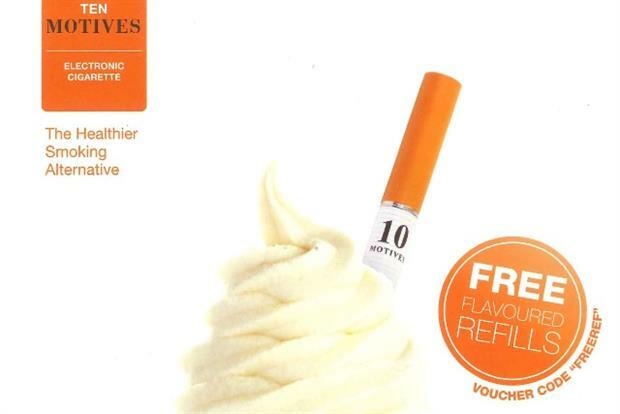 An ad using an image of a Flake 99-style ice-cream to promote Ten Motives e-cigarettes has been banned by the Advertising Standards Authority for appealing to children. The direct mail ad attracted the ire of two complainants, who argued that it was irresponsible because its imagery and promotion of different flavours appealed to kids. The circular ad featured an image of a Flake 99-style ice-cream in which the chocolate flake was replaced by an e-cigarette. The reverse side of the circular depicted various flavourings - a vanilla flower, coffee beans and chocolate - as well as images of coloured refills. Text on both sides of the ad read, "Free flavoured refills", "Choose a flavour for free" and "Which flavour do you favour?" Ten Motives argued the ad was intended to inform customers that the flavours were available for electronic cigarettes as an alternative to the taste of tobacco. It said it was designed to appeal to smokers and not children. The firm said the mailer had been targeted at a focused demographic group, a high proportion of which were smokers. Ten Motives said the mailer was likely to be seen by adults when received in the post, and unlikely to be seen by children. It argued that the product the ad was promoting was not available to those under the age of 18, so the imagery used in the ad was not irresponsible. But the ASA countered that the ad included a prominent image of an ice-cream and that its emphasis on flavoured refills also might be associated with ice-cream flavours. The ASA said: "We considered the presentation, in particular the images, was likely to be appealing to children and that it therefore should not have been used in an un-targeted medium that could be seen by them, for example when the mailings were posted through letterboxes." The ASA told Ten Motives not to run the ad again in its current form and that the company should responsibly target its future campaigns.